Online resource to prepare TOEIC test! TOEIC test is one of the most popular English skill tests to evaluate test takers' English level for non-academic purpose, e.g. general work or immigration. TOEIC is relatively easy comparing with academic tests, such as TOEFL and IELTS Academic; and its vocabulary is smaller than academic tests too. However all examinations have more or less challenge. If you don't want to fail, and re-write again, you have to prepare TOEIC exam sufficiently before test date. TOEIC test is designed for non-native English speakers to check their language skill to live and work in English countries. This test covers all aspects of language capacity: reading, listening, writing, and speaking. Of course, for individual test takers, the contents may vary with register, for example, one test package may just have two sections: reading and listening. No matter how many parts is in your test package, preparing TOEIC test includes many tasks. As a matter of fact, TOEIC isn't an easy test because its test takers are non-native English speakers and usually away from schools for years. The real scenario is that some test takers have to take TOEIC test, but they rarely use English in daily life and English skills learned in school are fading away. So after registering the test, you should start to prepare the test and schedule a plan till test day. Then you will find that either big or small lots of jobs are waiting for you to address. Building TOEIC vocabulary is one of them; and it is the toughest job for many people. Vocabulary is the foundation of all language skills: reading, writing, listening, and speaking. It will impact all test parts. If your vocabulary is weak and cannot match with the basic criteria, you hardly pass TOEIC exam. On the other hand, vocabulary is a common shortcoming for non-native English speakers, because English words are foreign words and have few chances to use them. This is why building vocabulary usually costs the most time in preparing TOEIC test. Here and there you may hear people talked about TOEIC vocabulary. However, when you seriously plan to study TOEIC vocabulary, you would face the first problem: what is the TOEIC vocabulary? The TOEIC organizer doesn't provide a formal word list for test taker to study and review; and none can give a word list and ensure it covers all words in TOIEC test papers. In general, a TOEIC vocabulary encloses words that were, or will are probably be, used in TOEIC tests or samples. In addition, different people have separate circumstances; one vocabulary cannot cover all situations. So your working should be based on a right TOEIC vocabulary, either size or difficult level. This website offers 4 TOEIC vocabularies to compare and select; and all vocabularies have built-in interactive practices. Besides, we developed some web apps to help test takers leverage modern information technology to improve study performance. Tip and experience papers introduce some tricks to use online free resource to speed up TOEIC vocabulary building. We hope this web site can give a hand to any TOEIC test takers who are struggling to overcome the vocabulary challenge. 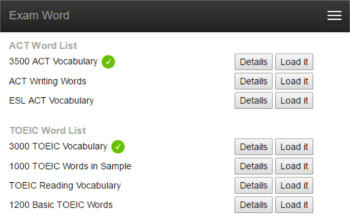 If you try to enrich TOEIC vocabulary, you have to get a right word list as first step. Different test taker needs different word list. A right word list means to match your level, goal, and time frame. Its words are useful and helpful in your future TOEIC exam. Here we offer 4 word lists and hope you can get your right one from them. To build vocabulary, TOEIC test takers need not only right word lists, but also study, exercise, and even self-test. Web app is convenient way to deploy interactive training and practice to users over all the world. It can improve study efficiency dramatically. Here we present 3 fantastic web apps designed for TOEIC test takers, especially high score hunters, to learn more words within less time. This app is built-in 1200 TOEIC words and organizes them into 30 units. It will manage your progress and push you finish all the words in 30 days. If you plan increase 1000 TOEIC words in one month, don’t miss this wonderful tool. Although you are supposed to learn one unit per day, two or more days are acceptable for any reasons. It’s a flexible tool and doesn't limit to any certain time frame. So don’t feel pressure from the title. It's a tough job for TOEIC test takers to accumulate new English words. Memorize, review, and repeatedly review. The job takes lots of time. Learn useful words and use efficient methods are two prerequisites to build TOEIC vocabulary successfully. VSO (Vocabulary Studying Online) is developed to easy this puzzle. It supports to load various vocabularies. We have 4 TOEIC vocabularies available to load in web site. Test takers can load other lists, including own personalized list. The app will save lots of overhead time, and push your studying and reviewing like a tireless tutor. Here we collect some tips and experiences articles that TOEIC test takers may be interested in. In general, we try to focus on vocabulary building alone; but a few other topics related to TOEIC test are included too, if we feel they are useful or helpful in TOEIC preparation. These papers will bring you more or less new ideas to speed up your preparing of TOEIC test. If you cannot find out TOEIC vocabulary PDF file to exactly match with your requirement, don't worry about it. Many people have similar experiences when looking for TOEIC PDF materials. Here we show you how to make customized vocabulary PDF by online resources of either this website or others. You will see steps of how to make own PDF file and then download it. The things are very simple. Interactive exercises based on Internet are a common way to build TOEIC vocabulary. Single choice question is a straight vocabulary practice style; it is also called word-definition match. All 4 TOEIC word lists at this web site offer each word dynamic single choice exercises. The format is as: single choice from 4 options. It is a flexible online resource to let test takers study and review TOEIC word by repeated practices. In TOEIC test, you don't need write too much except writing test. But if you have to take writing test, you must practice spelling to ensure your idea can be expressed in correct words. This website offers spelling practice for all 4 TOEIC word lists. Among them the best vocabulary for spelling exercise is 1000 TOEIC Words in Sample. Its words are relatively simple and easy to use in writing test. If you are working for a higher score, you may challenge harder word list. TOEIC is an English language test to measure the everyday English skills for working in an international environment. Now this exam has 2 forms: The TOEIC Listening & Reading Test is a two-hour multiple-choice test consisting of 200 questions divided into listening and reading comprehension; the newer TOEIC Speaking & Writing Test tests pronunciation, vocabulary, grammar, fluency, and sentence structure.